Mayor Steve Hagerty at a City Council meeting. Aldermen narrowly approved Hagerty’s appointments to a new affordable housing committee. Aldermen have narrowly approved appointments to a new affordable housing committee that will oversee the development of the city’s affordable housing plan. The appointments — made by Mayor Steve Hagerty — passed council at the Oct. 29 meeting with a 5-4 vote. Alds. Judy Fiske (1st), Robin Rue Simmons (5th), Tom Suffredin (6th) and Cicely Fleming (9th) voted against the proposal. The Affordable Housing Plan Steering Committee will oversee the development of the city’s Affordable Housing Plan and will have one year to complete the task. Fiske said at the meeting that she was not sure she was entirely comfortable with approving the committee, citing its large size as a factor. The committee is composed of 11 members, including Ald. Eleanor Revelle (7th) and some non-Evanston residents. 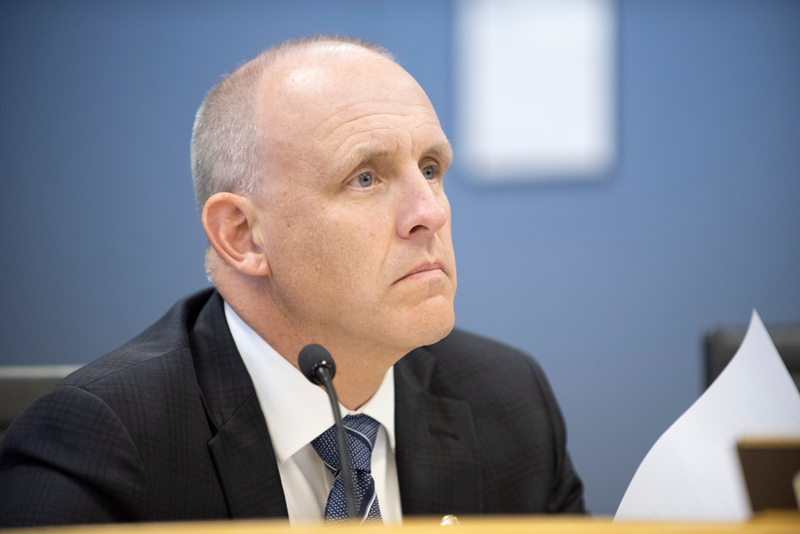 Hagerty said when choosing his appointments, he wanted to focus on people who had a “deep connection” to either Evanston or to affordable housing. He said the idea for the committee came from people expressing an interest in creating a working group to move forward on affordable housing issues. Besides Revelle, who also serves on the city’s Housing and Homelessness Commission and Inclusionary Housing Ordinance Subcommittee, the members include an Evanston Township High School graduate who works for the U.S. Department of Veterans Affairs and the president of the North Shore Village Board of Directors. Revelle said the committee also includes a resident who has struggled to find affordable housing in Evanston. She added that this committee will operate in a similar way to the committees that were formed to draft the 2009 Plan for Affordable Housing and the 2011 Heading Home: Working to End Homelessness plan. The committee will look at how to spend city resources and different strategies to address the issue, Revelle added. “We do believe that we have to be much more holistic in our approach and not expect to do everything that we need to do with government funding,” she said. Hagerty added this committee will serve a similar function to the city’s other working groups including the Alternatives to Arrest Committee and the Inclusionary Housing Ordinance Subcommittee, which recently proposed changes to the Inclusionary Housing Ordinance that council approved. After meeting for a year, the steering committee will present its plan to City Council for approval.